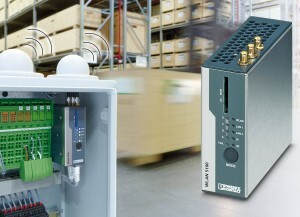 With its industrial WLAN Access Point/Client WLAN 5100, Phoenix Contact presents a new device for wireless communication in accordance with the WLAN standard IEEE 802.11n.The wireless component supports the Mimo (Multiple Input Multiple Output) technology with three antennas. This represents a significant increase in the degree of ruggedness, range, and speed of wireless communication when compared to the WLAN802.11a/g systems generally used today. Both in the 2.4 GHz and 5 GHz bands, this Access Point/Client WLAN 5100 achieves data rates of up to 300 Mbit/s.